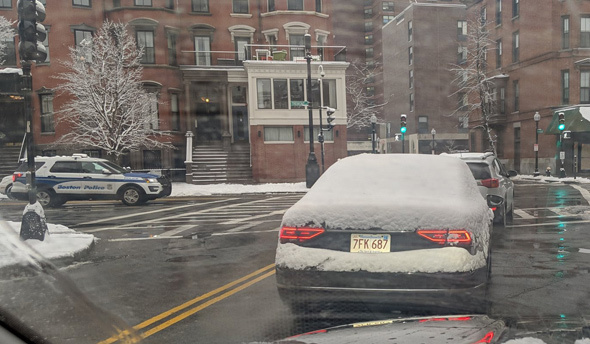 Matthew Gilberti captured this charming South End scene this morning, reports three BPD cruisers, including the one pictured, drove by the snow-covered car without stopping its driver. 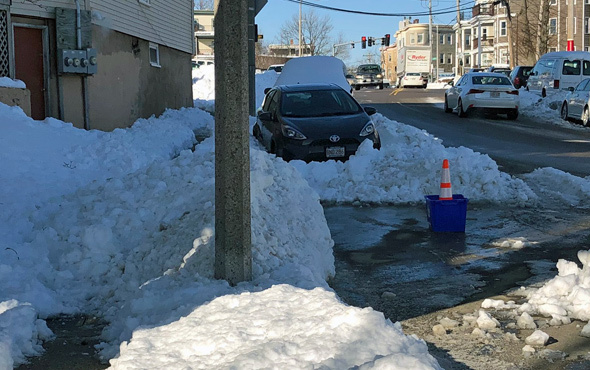 The Massachusetts Appeals Court today reversed a man's third OUI conviction for an incident in which a Revere police officer stopped him after watching get out of a traffic jam on American Legion Highway by pulling off the road and driving on the sidewalk for 200 feet. Read more. We're referring, of course, to the guy who drove down the turnpike with the other guy on his hood. Hood guy faced a criminal charge as well. However, the third guy, the one who pulled out his gun at the end of it all, is OK, because he has a license to carry. NECN recounts the action and provides copies of court documents with the two initial guys' conflicting stories. NBC Boston reports on an incident on the turnpike westbound in Weston, which ended with two arrests. With dashcam video. More details from State Police. 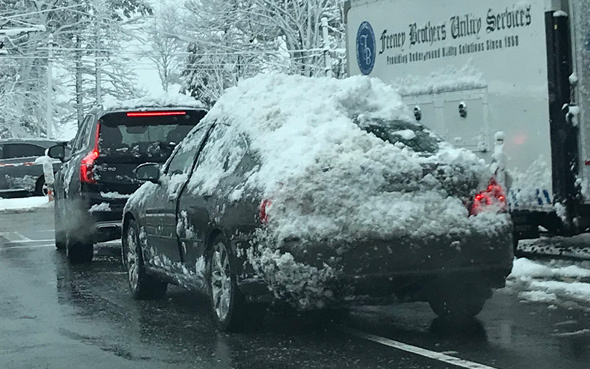 Don't worry: Matt captured this Medford action with his dashcam, not his phone. 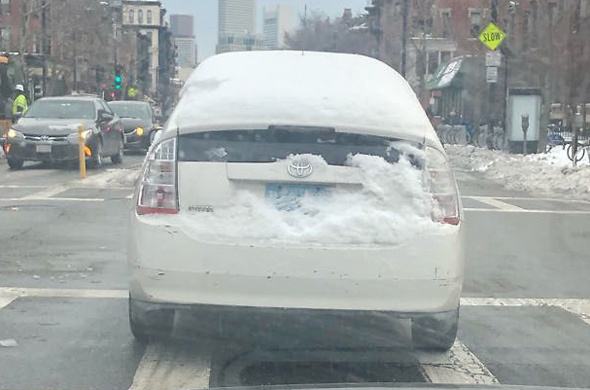 Louisa LaSalle spotted this beta Masshole (an alpha wouldn't have bothered at all with the back window) at Comm. Ave. and Chestnut Hill Avenue in Brighton this morning. Jamaica Plain News interviews one of the co-founders of Mass Hole Donuts, who explains why they only make donut holes and who confirms that, yes, he's a Masshole. Achieving the Masshole parking trifecta on Mass. 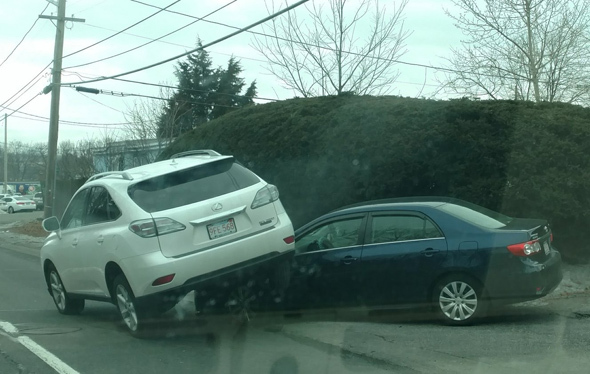 Ave.
Drew Starr could only stare in amazement at this person's parking job on Mass. 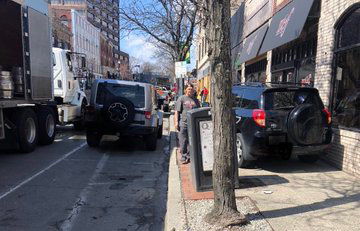 Ave. near the Christian Science Center today: Too far from the curb, in a handicap space and with "a crushed bike lane marker underneath." I told them they were in a bus stop right after they parked there, and they were like "whatever." Must be a confused tourist, because even Massholes aren't that stupid, right? Stefanie was walking down Tremont Street downtown tonight when she noticed this possible nitwit (with Mass. plates) driving down the one-way street the wrong way. Jesus, some New Yorker is a real moron. There is no violation for being a bad neighbor. Sorry.